On the 20th of August 2012 Cambridge MP Julian Huppert announced the publication of a science policy paper he has produced. Huppert is expected to ask Liberal Democrats to adopt his paper as their party policy during the upcoming party conference in September 2012. Decisions about which scientific projects are funded should be based on the excellence of the proposals. Anyone would be able to submit a project proposal to those responsible for making decisions on allocating public funds for scientific research. Currently this is not the case. Research Councils are not set up to really assess the quality of research proposals, despite the fact you might think was their core reason for existing. At the moment Research Councils have rules limiting who can apply for funding for example requiring a certain number of years of post-doctoral research experience and employment in an academic position in an accredited institution. Essentially currently only members of the establishment can apply for most UK government research funding, this creates an environment where there is a lot of patronage. Opening up applications for funding to all-comers would require research councils to change the way they operate. There would probably need to adopt systems for public, open, transparent assessment of, and perhaps collaborative improvement of, research proposals in order to assess the greater volume of proposals are more open system would, I expect, lead to. If project proposals are funded on solely on basis of the excellence of the proposal, then there will no longer need to be a direct connection between the person making the application for funding and the person doing the work. We could have collaboratively drafted project proposals to which many people have openly contributed being funded and then at that stage, post-funding, have people apply to work on them. The systems of motivation and reward for publicly funded scientists would be shaken up. There may be a need to develop a way of rewarding those who come up with proposals which are subsequently funded, other than letting that person being employed on the project after it receives funding. You might not need to financially reward such activity though, it might be something people would do for non-monetary rewards. Currently who will carry out the proposed work, and their background, is considered as, if not more important, than the proposal itsself; that would change. For some proposals it may well be the case that who is to carry out the work, and where, is a material factor which influences the assessment of the excellence of the project, but that would no longer generally and universally have to be the case. Such a revolution might result in commercial contract research organisations bidding to carry out a publicly funded proposal or elements of it. A career in public funded science would become more attractive if this area of the public sector/ public life, became a meritocracy. The need to perform feudal style service to a senior academic as a PhD student and Postdoc before becoming eligible to apply for public funding would be removed. My view is that just the meritocratic funding of excellence would alone go along way to tackling some of the reasons underlying why people leave academic science which Huppert seeks to address elsewhere in his paper. In my experience “I don’t want to be a post-doc” is one of the top reasons I’ve heard for leaving academic science. Allocating funding to excellent proposals would change the relationships between heads of departments and productive researchers. If all that matters is the excellence of the proposal it follows that a proposal could be funded without those making the application having specified where the work is to be carried out. Institutions and heads of department would then be in a position of competing to attract funded scientists (or projects) to their universities or other organisations and such competition would drive institutions to improve what facilities, and employment terms, they offer researchers, it may also motivate heads of department to focus on what should probably be one of their key aims to ensure that synergistic research is co-located and that a department becomes greater than the sum of its parts. I think it is excellent that Mr Huppert is now tackling the area of science funding and other elements of science policy; having previously said he was going to keep out of this area. Huppert’s policy paper expresses support for the the principle that researchers, not politicians, ought decide where research funding is spent. I think some public, national or international, aspirations and aims articulated by those we elect to lead our society are a positive thing. I don’t think there’s any harm in nudging an element our publicly funded scientific scientific output towards things which are aimed at improving the health, or the economy of the country. Huppert’s paper does include a section saying “Government does need to provide a strategic lead within the broader research landscape” which seeks to address this point. I think it’s also crucial for the Research Councils to work, not for the academic establishment, but in the public interest. I also think that in some cases our elected representatives ought be actively commissioning research to assist them with their decision making and to help them monitor the performance of policies they have put in place. We shouldn’t just hope that academics will submit research proposals which happen to meet the needs of policy makers; we should have a separate system for specifying and funding this type of work. Maintenance of independence and ensuring those with the money are not simply told what they want to hear is key, and obtainable with due openness and transparency. This is an area addressed by Huppert’s paper. His suggestions include significantly enhancing the role of the Parliamentary Office of Science and Technology (POST) and strengthening the presence of scientific advice within government departments. One area where I would like to see the Government currently commissioning research is in to the impact of Elected Police and Crime Commissioners; and to ensure that as much is learnt as possible from the vast number of experiments which will in effect follow the elections as different approaches to policing are taken in different places. I would also like to see as many policy changes as possible actively designed as good quality experiments from the outset, Huppert’s paper effectively suggests this in other words when it calls for more use of pilot schemes before widespread adoption of a policy. Huppert’s paper tackles the current problem that much of the output of even publicly funded academic research is not openly and freely accessible as access to research papers is charged for by journal publishers. Huppert’s proposed solution though, paying publishers up-front, and then making the material available free of charge to those who wish to read it, is one which appears to me designed to tackle the short term issue, and to maintain the existing scientific publishing industry, rather than one which would kick off a revolutionary change in the way information is shared, online, by scientists. I think the important thing is to forbid publicly funded scientists from only making the output of their work available via ways which it costs to access. Current policies are not firm enough in this area, Huppert’s document similarly fails to make a clear statement on the matter. I think allocating funds to preserve the current publishing industry is misguided and will provide an economic disincentive to change. Huppert’s paper aspires to see more research published where negative results were found, particularly the results of unsuccessful clinical trials; however he his clinging to the historic model of publishing scientific results which was one of the factors leading to the problem arising in the first place. A scientific paper could be a living document, and open and collaborative work in progress for a period, and then something which is subjected to open, public, review and challenge. I don’t think our national science policy should tie us to a historic way of working. Pre-publication peer-review might well be a gold standard and may well function in some areas; but often it’s flawed; with no anonymity and bargaining between academics – who do deals such listing them as a potential reviewer for one paper in return for sticking their names as authors on the next. This leads me to note one omission from Huppert’s paper: any mention of such scientific ethics. The policy paper contains a proposal for a government loan for post-graduate tuition fees to be paid back via post-­‐graduate tax. My concern here would be that if such a system was in place it might encourage research councils not to fund graduate tuition fees up-front. 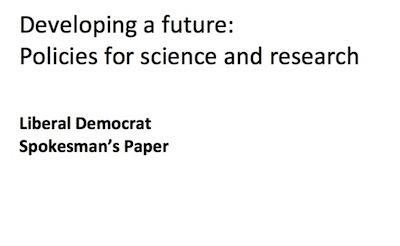 The paper’s title page reveals Huppert has added Liberal Democrat spokesman for science and research to his array of titles and positions. Citing expert opinion is not good quality evidence. Why I Support the Degrading is Degrading Campaign – December 2011 – Discusses the often arbitrary decisions by those who currently control access to academia. Members of the Liberal Democrats will presumably be looking at Huppert’s paper with a view to amending it and strengthening it at their conference. The outcomes of all UK taxpayer funded research must be made available to all free of charge and available for re-use. Funding will be made available as part of all research grants to contribute to the costs of making the research outcomes openly available. Innovation in the methods used to openly share research results, assess the quality of work, and promote open scientific collaboration will be encouraged. 2. Paragraph 16 – delete all but the first sentence. 3. Paragraph 86 – delete. There should be a route enabling those completing an undergraduate course to become independent scientists as rapidly as possible. Some though may wish to benefit from longer periods of PhD study, perhaps even involving a taught element for those who wish to enter very different areas from those covered in their first degrees, so there should be a variety of provision. A PhD should be about making a significant contribution to a field of study. Other elements such as teaching in schools, (and I would say additionally contributing to undergraduate teaching), and public engagement should be encouraged, perhaps as funding conditions, but ought be separated from the requirements for the award of the PhD. At a strategy level the policy document should probably simply seek to strengthen and give more weight to the currently rather lightweight approach of the Research Councils in the area of ensuring they work they fund is carried out in a legal, ethical and moral manner. It appears Huppert’s paper itself is not what’s going before his Party’s conference. The conference papers show Huppert’s science motion is to be debated on Monday the 24th of September at 09.00. A. The UK spends less than 2% of GDP on research and development, less than it did in the 1980s and significantly less than OECD and G7 averages. B.	OECD analyses suggest that public investment in research and development pulls in private sector investment, rather than crowding it out. C.	Despite historically poor funding, the UK has performed extremely well in research outputs, whether measured in academic papers published or in key inventions and discoveries. D.	It is very hard to predict at the outset what the impact of blue-skies research will be – the Internet, lasers, and monoclonal antibodies have had huge, unpredictable benefits. E.	There is a shortage of people entering and remaining in Science, Technology, Engineering and Mathematics (STEM) careers, particularly women and those from poorer socio-economic backgrounds. F.	Research and development are global activities, with people and ideas from around the world being needed for successful progress. I. Investment in research and development is critical to the current and future economic success of the UK. II. Curiosity in the way the world works is to be encouraged for its own sake, to build deeper understanding, as well as for economic growth. a)	Ensure that STEM subjects are well taught in schools and universities. b)	Ensure that academic and research careers are fulfilling and well supported. c)	Ensure that immigration rules do not place arbitrary barriers in the way of skilled individuals coming to or remaining in the UK. IV. Policymaking should be evidence-based, and scientific advice into policy making should be impartial and independent. The Government science budget is ring-fenced, for both revenue and capital expenditure. We aim to increase the ring-fenced science budget by 3% above inflation for 15 years, and will seek to arrange a cross-party consensus to deliver this over such a timescale. Encouragement is provided for research investment by industry, charities, and the EU. ‘Blue-skies’ research continues to be well funded, in parallel to applied research, and that political interference in science funding decisions is avoided. Specialist science teachers are available in all schools, with funded continuous professional development entitlements. Immigration laws are revised to ensure that bona fide international students can continue to come to the UK to study, that the best and the brightest can stay in the UK, work and settle after graduation, and that special provision is made for academics, scientists and other chartered individuals to work and settle in the UK. An income-contingent loan scheme is established for post-graduate students, so that they do not have to pay the cost of their courses up-front. Open Access publications and Open Data principles become the norm for publicly funded research. The deadline for amendments was the 10th of September, so it appears conference goers are just there to vote, not amend and develop policy?? Huppert has written an article in which he states it is the policy paper as much as the motion that is to be debated at the conference. It may also be available on the BBC’s “democracy live” service. While I didn’t re-state it in the above article I have previously suggested that in Cambridge, removing the veto Cambridge Colleges hold over degrees (and aspects of progressing towards them). This may be only a small, local, point but it would assist in ensuring entrance to scientific professions and eligibility to access public funds for science, is meritocratic and not based on conformance with obscure college rules and traditions. I would like to see record keeping, and oversight of individuals charged by colleges with making decisions required so that the extent of the problems can become known. (Actually I think even the act of recording and oversight might be sufficient to change behaviors). Where the taxpayer funds students, such as research students funded via the research councils, I think they ought require some basic standards be in place. This is something I’ve written to the BBSRC to suggest and I have more recently asked the Department for Business, Innovation and Skills, about their Grant Funding Agreements for the Research Councils, I think this is the level at which action needs to be taken and Martin Donnelly, the Permanent Secretary at BIS ought bring these agreements up to date and stop the research councils from throwing money away without due regard to what is being obtained in return for it.